What is Natural Press Fresh Flake™ Small Bale Alfalfa? Available exclusively from The Gombos Company, Natural Press Fresh Flake™ small bale alfalfa is exactly what the name says: Natural Press and Fresh Flake™! As opposed to chopping, blending, and mixing hay and forcing it into a bale, this hay is naturally pressed from the original farm-fresh alfalfa bale. Unlike large export bales, these bales are small and easily handled. Flaking apart naturally and easily, they are available 25-30Kg or 55-60Kg bales. You can learn more about natural press alfalfa and bale sizes by reading Hay Export Packaging for Alfalfa Export. How is Natural Press Fresh Flake™ Small Bale Alfalfa Produced? 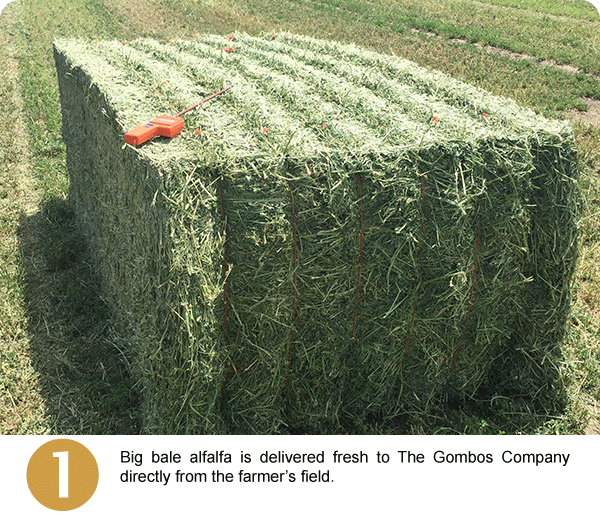 Fresh from the farmer’s field, big bale alfalfa arrives at The Gombos Company. Big bales are usually 3x4x8 and weigh up to 1,200 pounds (550Kg). After the quality control check, the hay resides in protected storage or staging areas until ready to press. 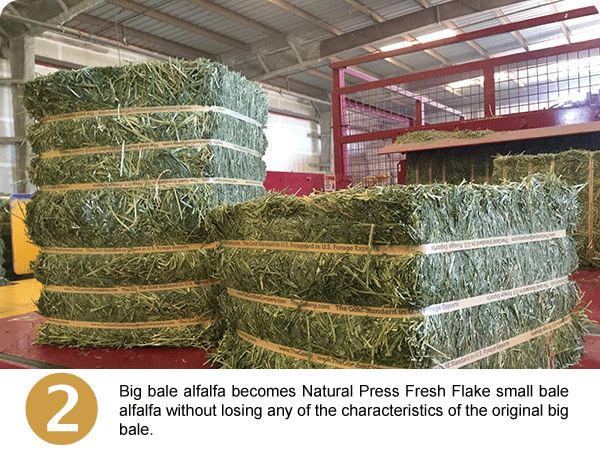 Big bale alfalfa becomes Natural Press Fresh Flake™ small bale alfalfa. Throughout processing, the physical characteristics of the original big bale are never lost. Unlike old hay press technology, natural press technology does not destroy alfalfa stems and leaf attachment. 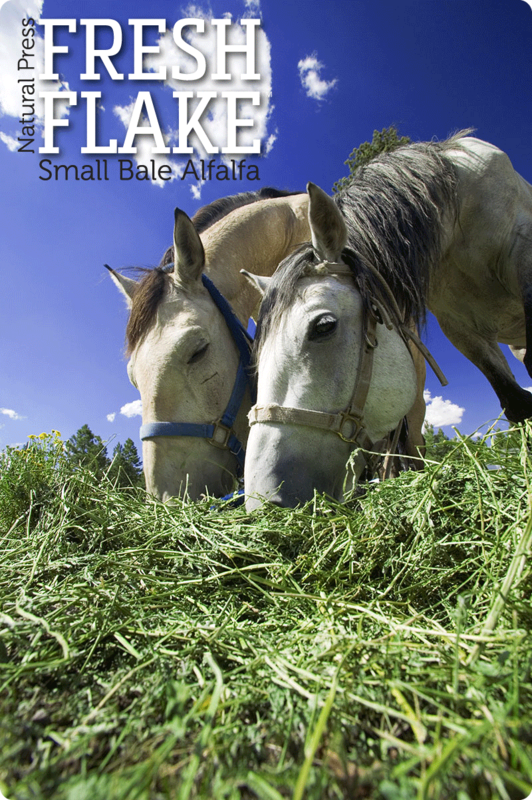 With 25-30 layers per bale, Natural Press Fresh Flake™ small bale alfalfa flakes apart easily and naturally. In the 25-30Kg bale, each flake weighs about 1Kg. Similarly, in the 55-60Kg bale, each flake weighs about 2Kg. What are the Benefits of Small Bale Alfalfa? The most obvious benefits of small bale alfalfa are ease of handling and quality control. Unlike large bales, one person can transport a single small bale by hand or load several small bales to a feeding cart. At 1-2 Kg per slice, one person can hand-feed an animal while visually inspecting every flake. Generally speaking, small bale alfalfa is higher quality (real or perceived) and more consistent in appearance. Furthermore, moisture content is evenly spread throughout each bale. Unless moving numerous bales at once, a forklift is not required. How is the Hay Loaded into the Container? In order to improve logistics costs, containers are loaded to the highest weight allowed by law. For example, in California containers may only be loaded to 22.5 MT. Loading methods for Natural Press Fresh Flake™ small bale alfalfa include bulk or G-PAC™. Whereas bulk-loading is matter of containerizing single bales from back to front, G-PAC™ involves wrapping units of 12 bales or 24 bales before loading.